Well we are excited to announce the first commentary in the Believe Something Better Commentary Series has been finished. (It is important for you to understand this is not the first volume of the series but rather the first commentary of the series.) The commentary on the Epistle of Jude is finished. We are posting three things on this blog here today for you to see. The first is the commentary which has recently been finished. We are always open to hearing feedback on anything we post here and you can give us your feedback through e-mail or comments here on the blog. The second thing we’re posting is a set of study notes and an outline for Jude (as you will see the outline is in the commentary as well). These notes are based on the commentary and a set very similar will be made available for each book of the Bible. They are meant to be supplementary to the commentary. These study notes would allow you to have notes available while you study the Bible. The third and final thing we are posting is a complimentary copy of the Epistle of Jude (from the Breath of God Version). This will allow you to refer to this version of the Epistle as you go through the commentary or notes. These three things are the first in many posts you will see in the future (Lord willing) giving you similar announcements. We do not plan on posting the commentary every time we finish one, but rather just giving a general announcement. We also have the books lumped together to allow for publishing. We hope you enjoy this and we look forward to seeing feedback from you. Please not this is not the final layout for the commentaries, just an easy layout for it to be presented here on our website for you. So the Believe Something Better Commentary Series is about to have its first entry finished. The commentary on Jude is going through its final round of editing then it will be read to be unveiled as the inaugural entry in the series. We will be posting a version of it here under a creative commons license. We also plan on recording it as a free audio teaching here. We plan on putting Jude up here for you to see what things are going to look like. As far as the rest of the series goes we will only be publishing the audio for free as well as notes and outlines. We plan on having these study aids available for free for everyone to download and use. The commentary series will be available for purchase as an ebook or hardcopy book with all proceeds going back into the ministry to help produce more content and upgrade the website. All in all this update is here to let everyone know to keep your eyes peeled to see Jude coming out. We have a plan in place as far as getting through the rest of the Bible as well. We look forward to putting this forward soon. I wrote an blog post for my personal blog about making decisions. As I read it more and more I have come to realize it is on a subject on which I was planning on writing a Thought. So you can go read the post on decision making and get a look at some of the ideas I am working into a Thought for the future. I hope you enjoy it. Well today I started an adventure, with my wife. We are reading The Daily Bible published by Harvest House. The layout was designed and a devotional commentary was written by F. Lagard Smith. I’ve my copy of it for a while and I read a good portion of it. The actual text of the Bible is NIV (1984 ed.) which I have read several times and had used (as it was the translation of my main Bible for a time before I started using the ESV more). So as far as the text of the Bible itself it is using a solid translation and I am not here to debate translation. What I am here to write about is the journey of the way that this Bible is laid out. It is laid out without verse and chapter numbers in the text, as it is trying to encourage reading, and it is laid out in chronological order. This means that some books appear in different locations or the text of some books appears one after the other. This is most apparent in Samuel, Kings, and Chronicles where we have many books being woven together. The Prophets are placed at the time at which their prophecies were given and many of the Psalms are placed at the time that they were written. It is also very apparent in the Gospels and Acts. In the Gospels we have the four Gospels being woven together into a Harmony (for more on Gospel Harmony click here). A Gospel Harmony is something that the Church has been trying to put together since the early days (about the second century with the Diatessaron) and this Bible presents one version of a harmony. Acts is a very interesting versions with the Epistles of Paul being laid out in their place in Paul’s life. All of that really is beyond the point that I’m trying to make. I enjoy reading. I read a lot! This Bible lends itself to that very much. In the margins of next to the text it gives the references of the text that you are reading so that you can easily reference any passage that you are reading. The commentary devotional doesn’t take you out of the passage but it helps to bring your focus to what you are reading. Personally I really like the layout. I’m really enjoy the experience of reading this Bible and the experience is different. The books aren’t laid out in the typical manner (for any tradition) and so it makes a very good way to make the text new and fresh again. I would highly recommend this to anyone who wants to make the Bible new again or to anyone who is just looking for a way to read the Bible and keep at it. As the title says the readings are broken up by day and it makes it easy to read through the Bible in a year. This is a great addition to anyone’s library and will reinvigorate anyone’s reading experience. I recommend it for anyone and everyone. I just have a quick update for the Newsletter. This update is about prayer, more specifically prayer requests. We, at Believe Better Ministries, are always open to praying for you when ever you want us to. That being said we would also like to open it up to the rest of the Community that has started following our Blog and those who have already signed up for the Newsletter. If you ever have a prayer request feel free to e-mail it to us at BelieveBetter[dot]Ministries[at]gmail[dot]com we will always pray for you! If it is a more of a confidential prayer request, feel free to tell us so. If it is even more confidential but you still would like prayer you can always e-mail me, RB, and I will pray for you. You can e-mail me at BelieveBetter[dot]89[at]gmail[dot]com. But again we want to open this up to the community and spread the prayer. If you haven’t signed up for the newsletter yet, you can do so by clicking the link on the right at the top of the sidebar. And over the next two months (because our first issue is coming out in January) we will be collecting prayer requests to go out to everyone who subscribes. Hello everyone, from Believe Better Ministries! I am continuing through my punch list of things that I am working on. This includes Ruth, Jude and all the others on my list. I’ve also got a few new things in the pipes for the upcoming year. The first of which is the Believe Something Better Newsletter. This is the premier newsletter from Believe Better Ministries and will be coming out monthly. It will either be at the end or beginning of the month (that is to be decided later) and it will feature articles that have already been posted or new articles Thoughts as well as poems and other nuggets. One thing that is on my heart is prayer and I am hoping to have a section in the newsletter where we can include prayer requests. I will be praying for them and I hope other readers will be as well. The first issue of this will be coming out in January but you can sign up now by clicking the link over on the right had side of the page. This links to the second new thing coming down the pipes for 2016 and that is the Believe Something Better Podcast. This will be a monthly podcast that will feature similar content to the Newsletter but will be rolled out more like a radio show. I plan to have as much content being put into your hands as possible. I have ideas going into the recording for the first episode already. Finally: What is a Thought? A Thought is what I am calling a short writing (or micro essay) that I have made on any given subject. It could be something that I write a longer piece on later or it could be something that I’ve already written on but have a new idea. Really it is what I am calling my little ramblings and ideas that come to me as I study the word of the Lord. Well I’ve been silent recently and I apologize for that. I have been putting a lot of time in on other projects. The biggest thing that has happened here this month is my wife and I are now parents. We welcomed our little girl, Sophia, into our family on the 6th. We are so excited, there aren’t even words to express what we both feel about her. This has led to the Psalm that I posted earlier this week and I have a new Thought in the works to express some of what I’ve been feeling and learning. This should be up tomorrow or sometime soon this week. Really though what I have been up to has been working on the Epistle of Jude. I have been running it through edits and writing notes. As I am part of the Editorial Team over at Breath of God Ministries I have been putting a lot of time in on that book. I also wrote a commentary on the book that I will be coming out with shortly, but has been used to make study notes for the Breath of God Study Bible. You can read all about what we have done on their post about the project. The next thing to tackle on that front will be Ruth. You can find more information on their website. Finish my Thought that I have already started. I hope that you will appreciate what I have to say regarding Jude and what I have been learning. What Bible do I use? I have received a few e-mails recently as to exactly what version of Bible do I read from. The question is a bit mind boggling: I use many. Let me start off by saying that besides being a Theophile (lover of God) I am also a bibliophile (Book Lover) I love actually holding books. I love the smell of them, the feel of them and I love to read them. So, yes, I do have a smartphone that has a Bible App on it (actually I use the app put out by YouVersion) but I love to have an actual book in my hands better than reading off the smartphone. I’m going to start with physical Bibles to explain exactly what I mean. I have a Bible for almost every occasion and activity. The main version that I use is the English Standard Version (or ESV) I really like this translation and the tact that it takes. I was put onto this Bible by someone that I trust very, highly and they did not lead me astray. 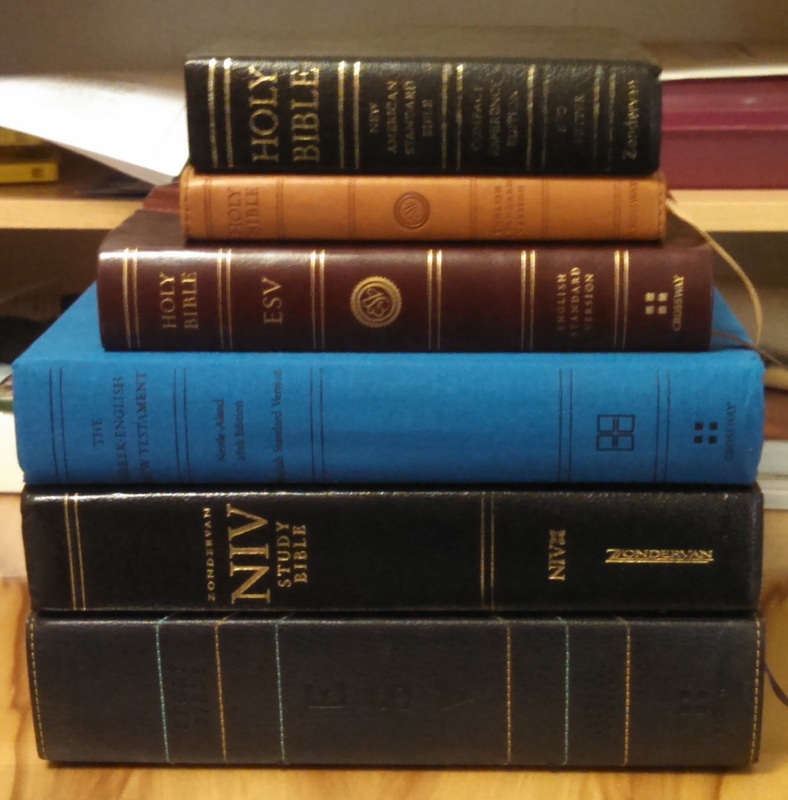 As you can see by the picture of my stacked Bibles (and this is by no means all of them – just ask my wife) most of the Bibles that I use of the ESV translation. In fact in that stack there are only two that are not ESV and that is my Zondervan NIV Study Bible and my NASB Compact Reference Bible. Before I delve into exactly why I use all of these Bibles and for what I will start off by say exactly why I like the ESV Translation so much. I have found it to be a very accurate and literal translation of the original Greek and I have enjoyed its literary tact of translation. Because of this idea of a Literal and Literary translation the ESV is easy to read and understand. It is also fun to read because in many ways it read more like literature than a Text Book (which sadly some Bibles – and Bible Formats – do read like a text book). That being said I am going to delve into the stack of Bibles that you see in that Picture. This ESV Study Bible is by far the largest Bible I own. Measuring in at 9.5 inches tall 6.75 inches wide and 2.25 inches thick, it is huge! It feels bigger than those measurements make it sound. I have gotten a lot of use out of this Bible since my wife bought it for me almost three years ago. I love the amount of information that is packed into this volume. Do you have a question on a verse and its many interpretations? This Bible can most likely answer your question. The spine of the Bible, while large, is not overly cumbersome for reading. It also (because of this size) lies open on a flat surface very well. 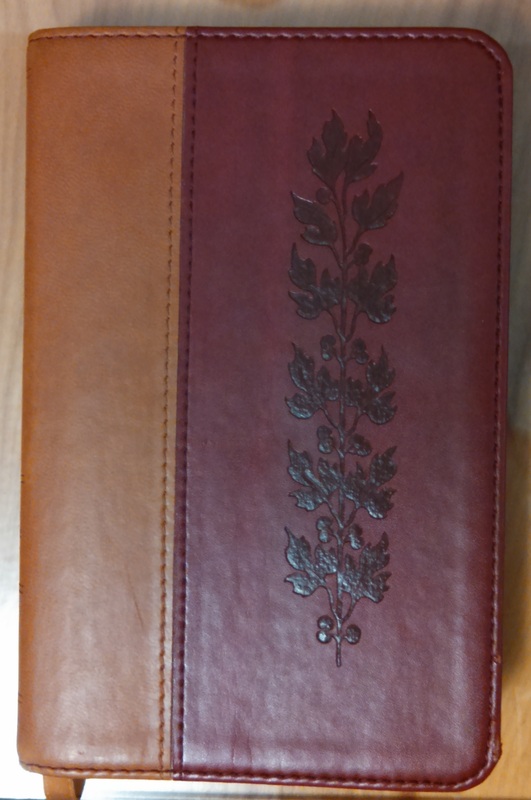 I got an imitation leather copy which Crossways (the publisher of the ESV Bible) calls “TruTone”. This TruTone Bible was and is easy to use right out of the box, no needing to break in the leather, though feeling like the leather the whole time. As you can see from the Front Cover it is really a rather large tome. 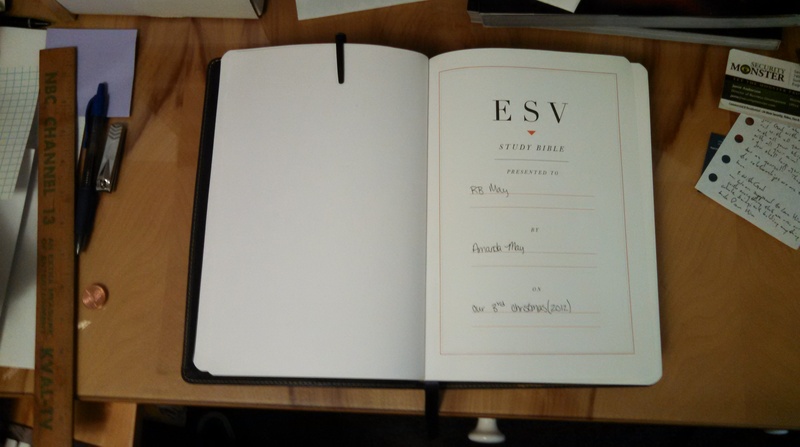 The inside of the ESV Study Bible was masterfully made. The TruTone cover opens easily and takes a beating pretty well. As you can see the pages are rather stiff though and took some weight to hold them open to get this picture of the Dedication page, but once you’ve made it into the actually Bible (from Genesis 1:1 on) it stays open and lies flat. I have pictures of it lying open but for space I think I will simply leave that to your imagination. 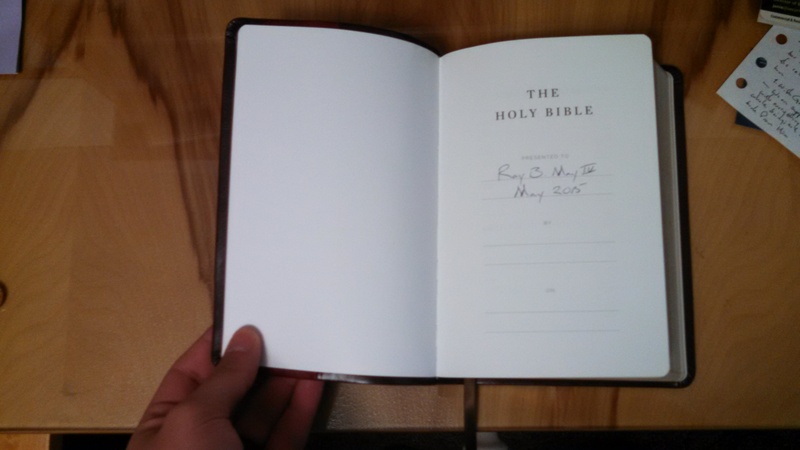 The final picture I have and the whole reason this Bible makes the list of “Bibles I Use” is the study value. This is all the bookmarks that I use in this Bible. Yes, before you ask there is a color code but I am not going to explain it here. Suffice it to say that each one of the those colors means something different. Let’s move onto the next Bible in our line up. 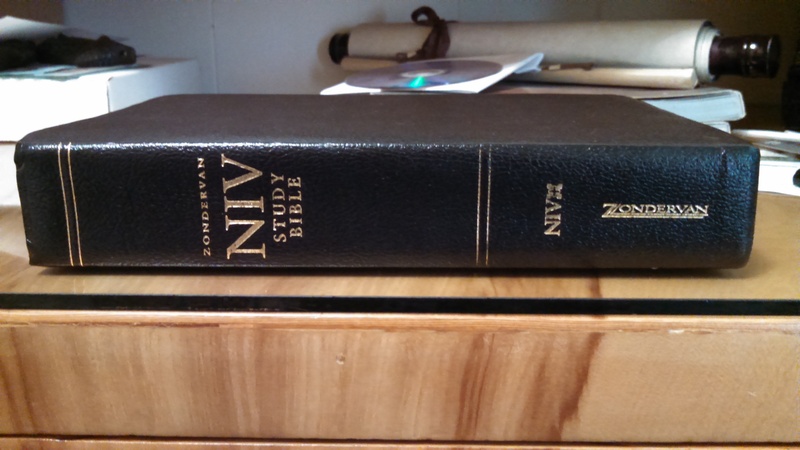 This NIV Study Bible by Zondervan is the second edition of this Bible that I own. The first my parent gave me way back in 1999 and it is really the first Bible that I ever owned. It got a lot of use. It is so used that pages are falling out of it. 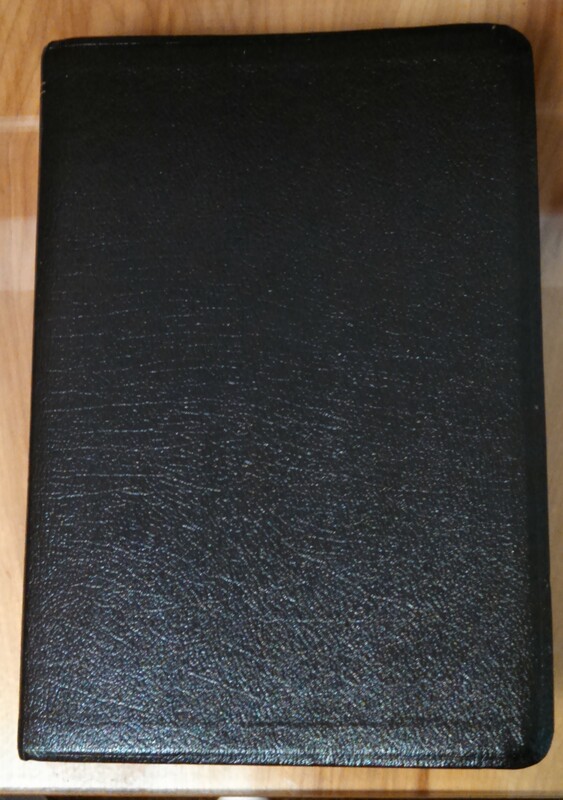 That NIV Study Bible (the 1995 edition) is currently kept in a Bible Cover (or case or what ever you want to call it) and on the shelf. My 2002 edition is actually kept on the shelf a lot now too. It is an up to the Bible I grew up with and, so, holds quite a bit of sentimental value with it – besides that whole my parents got it for me thing. The 2002 edition was actually purchased for me by my parents as well. I like the information that is presented in the NIV Study Bible I have just wanted a more literal translation and so have changed over to the ESV. This Bible is obviously not as large as the ESV Study Bible. This comes, partly, from the information other than the Biblical text and partly due to the fact that the ESV Study Bible has the Bible’s text in a Single Column while the NIV Study Bible has the Bible’s text in a Double Column. For ready (and therefore studying) the Word I enjoy the single column more. It is more like a book that way and the notes can be viewed as supplemental material. 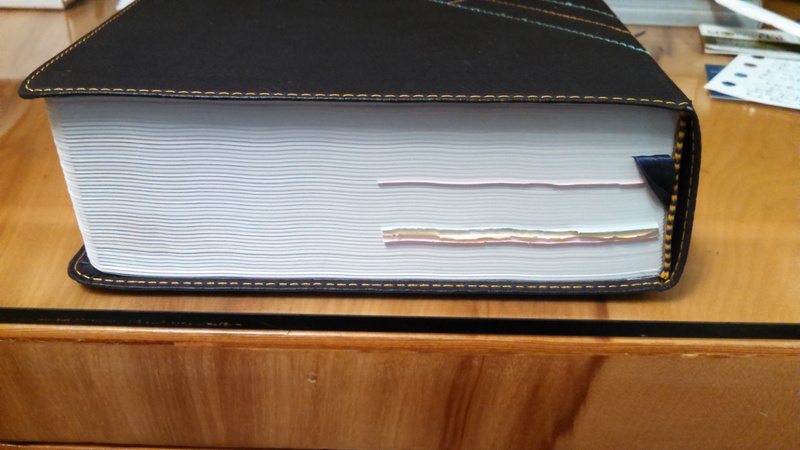 As you can see the binding on this Bible is not as flexible as the TruTone on the ESV Study Bible. 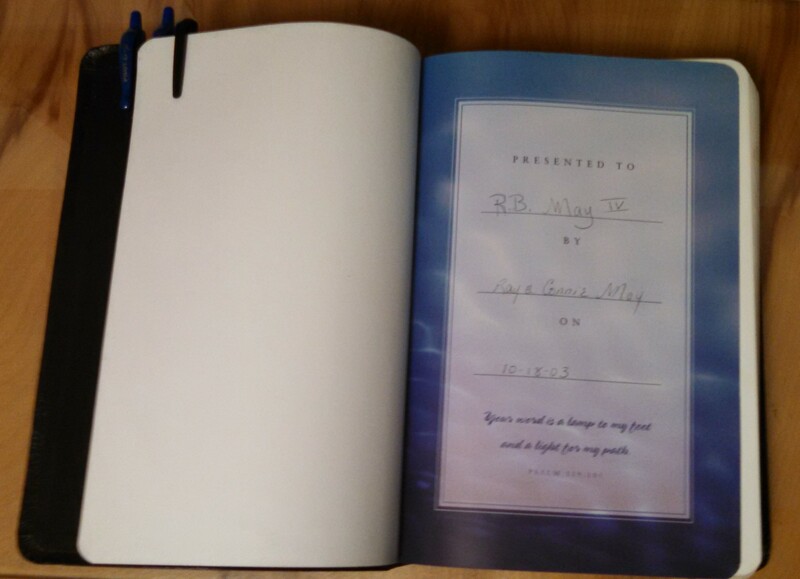 I had to put some weight on the Cover and the pages to get them to stay open to the Dedication Page. This Bible is great resource for studying, with all the notes and information it has inside. The amount of the information is not as great as its ESV counterpart but I still have relied on this Bible (or its previous edition) for nearly two decades of Bible study now. I would recommend it (actually the new edition that Zondervan has out) to anyone who asks. 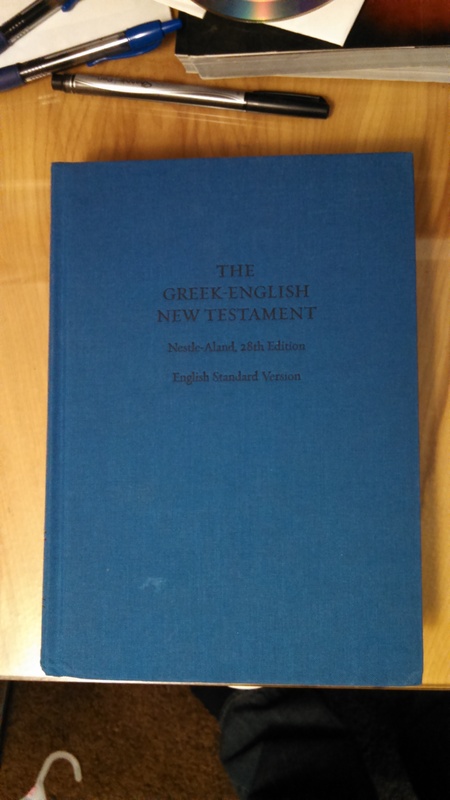 Next on the list and still in the “Study” Category is The Greek-English New Testament, Nestle-Aland 28th Edition (NA28)/ESV. 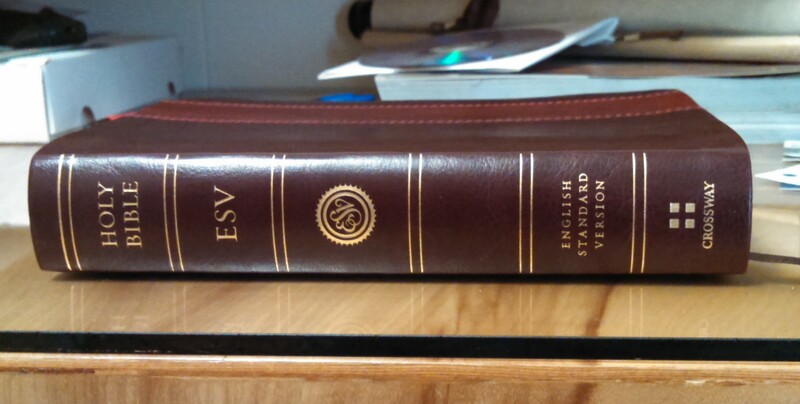 Yes another ESV, but this time it is only the New Testament and it has the Greek too. Not really making my case am I? Well this has the most recent edition of the Nestle-Aland Greek Text (the text that the ESV and most major modern Bibles are translated from – in fact I think all modern Bibles are translated from this text except for the NKJV, the MEV and the WEB, I could be wrong on this) and the Text of the ESV on opposite pages. 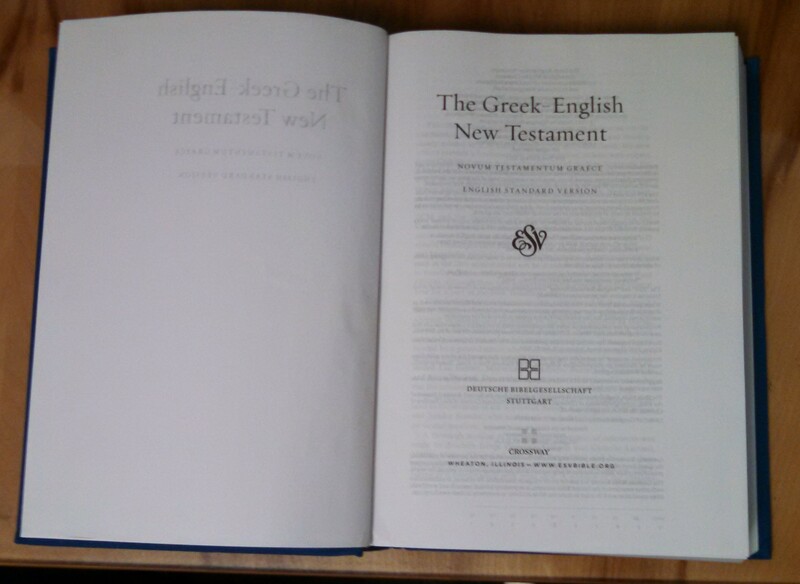 This allows you to look at the Greek Text and compare it to the ESV to really see how literal it is. It also allows those who are learning Greek to have an English translation present in order to be able to figure out what word they are looking for. 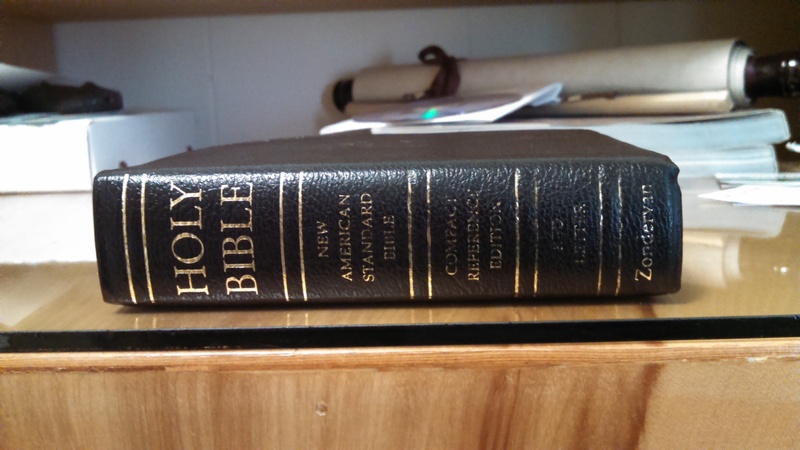 This Bible, being hardbound, does not have the shortfalls that either of the other two Bibles do. It is splendidly designed for what it is. It will stay open to either the first or last page with out much coaxing and it lies open and flat with out bother. It is a great edition for those looking for a polyglot (plural language) New Testament. I have particularly enjoyed the ability to look straight at the Greek during my reading. The text of both the Greek and the ESV are single column which (for me at least) lends itself to reading better than does the double column (as I said before). The verses on one page match up to the verses on the adjoining page which makes finding a passage in either text a breeze. I highly recommend this Greek-English New Testament as something to be added the avid Bible Student’s Collection. We have now crossed the line from “Study” into reading. There is a lot to be said on the subject of “Reader’s Editions” of the Bible. Lot’s of people have different views all the way from your standard double column all the way to no chapters or verses (or something in between). For me a reader Bible is a single column Bible that still has the chapters and verses. I like them there because it is easy to break up the text into readable pieces as well as it is easy to reference the text you are reading with someone else. This is why the chapter and verse apparatus was added to the Bible in the first place. How hard is going to be to discuss a passage of Scripture with someone when the discussion starts like this: “Hey you remember where Paul was writing to the Romans about that grace thing and…” I mean this is just horrid. Many people will have different ideas, which is great I don’t want a bunch of me’s out there. These different ideas are what breeds the different versions of the “Reader’s Bible”. Any of Crossway’s amazing Single Column Bibles I consider a Reader’s Bible. They have come out with everything from the cheaper to the expensive and in between. (You can check out their Expensive, In Between and Cheaper options – Please Note that I said “Cheaper” not cheap because even some of the more expensive versions come in cheaper bindings.) 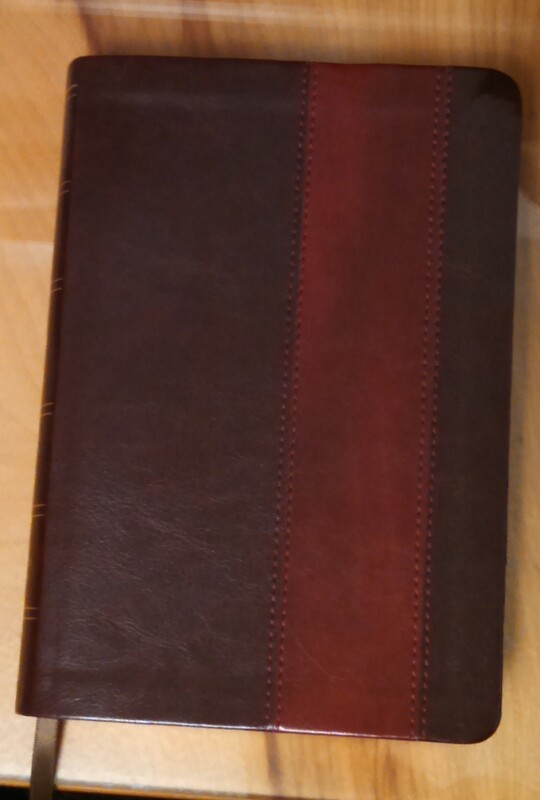 I am using the ESV Single Column Heritage Bible as my reader. This is a relatively recent addition to my collection of Bibles, but I am already in love with it. This Bible, partially because of how new it is, does not lay open very well. The binding is quite a tight binding and it will close on itself until you’ve made a few books into the Bible. As you can see I am having to hold it open to take a picture of the dedication page. The cover that I chose was a TruTone (Imitation Leather) partially because of price and partially because these newer imitation leathers are being shown to hold up better under use than some of the leather covers. The internal layout of the Bible is gorgeous with a single column text all the way through the Bible and a paragraph layout. To me this is visual poetry, or visual music, because it simply makes the Bible easier to read. It feels more like a book or letter from a friend rather than a Text Book. It also engages me more as a reader and I want to read more rather than just find verse such and such. I can’t help but gush over this Bible, partially because it is the newest in the collection and partial because it is (so far) my favorite. I have only been reading from it for a few days and I am just in love. 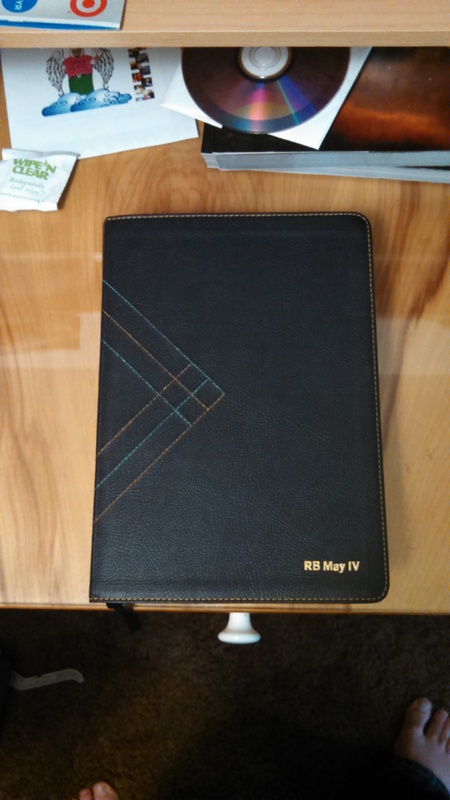 The ESV Compact Thinline Edition has become my new travel Bible. Crossway doesn’t make this Bible anymore. I believe that I got this for my wife before we were married got her a new one after we were married and so this became my hand-me-down. It is very small, its cover measure about 6 inches tall by 4 inches wide and it is about 0.75 inches thick. 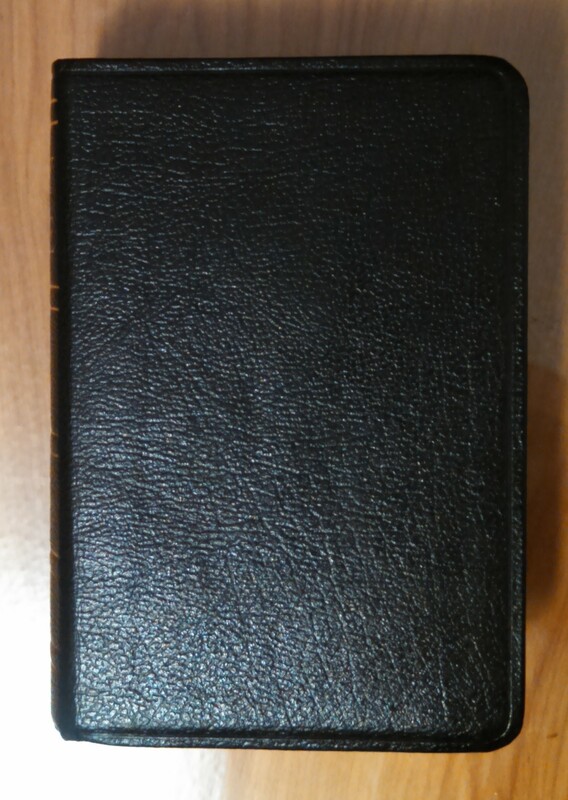 There are a lot of benefits to the size of this Bible, most of them are in its portability. But there are some drawbacks, too, as we’ll see in just a moment. The major thing that is most notable about this Bible for me is that it is easy to throw in a bag and go. If I am travelling across country or down to the diner for a morning Bible Study. It is just easy because of its size. But a major drawback to that size has to be the size of the type. It is pretty small. That could be manageable if it were in a single column but it is in a double column to decrease the size of the Bible even more. This can make it hard to read, but I guess it is the sacrifice we make to a be able to take this Bible pretty much anywhere. Again you’ll notice I am having to hold this Bible open to the dedication page. 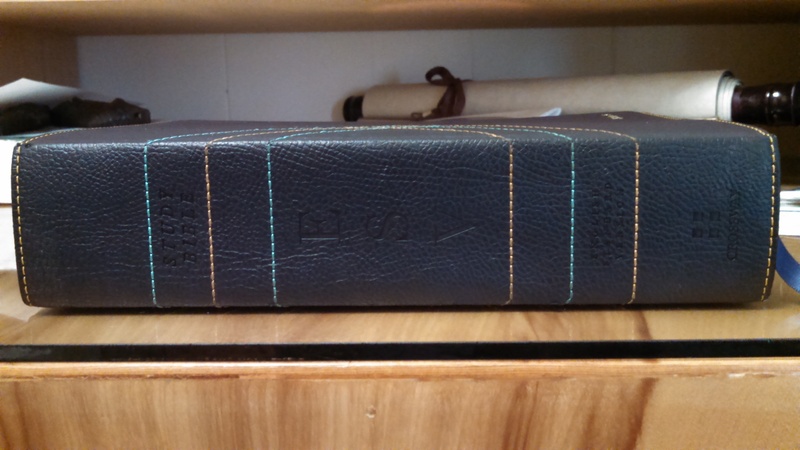 This Bible is closing in on its decade mark and its bindings have still not loosened up. In a way I guess that is a good thing because it keeps the pages safe on trips, but at the same time this Bible does not lay flat until you get quite a ways into it. The fact of the matter is though that it is not very often this Bible is lying on a surface to be read. The type is just too small. 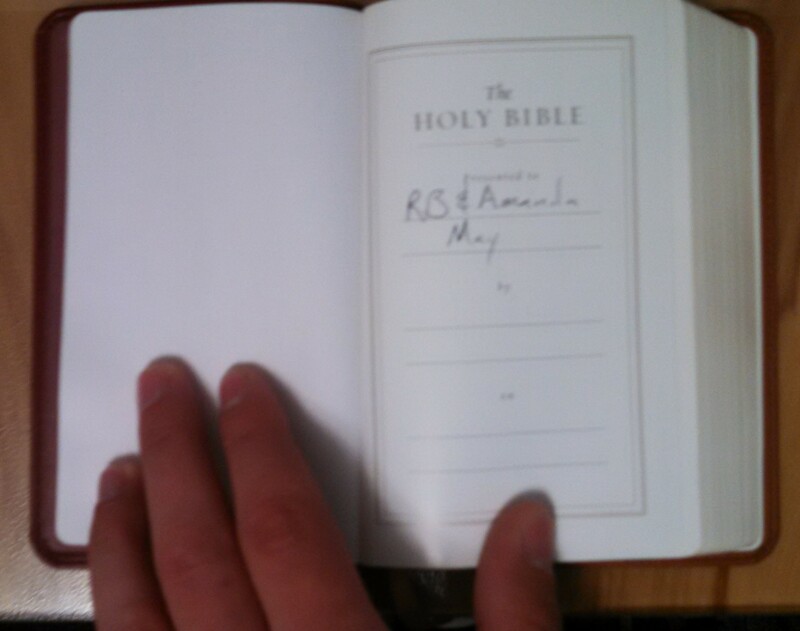 I have greatly appreciated the workmanship on this Bible because it has followed halfway across the country and back. This Bible has carried me through ten years of my life and I am very thankful I had it. As you can see the words are starting come off the spine from use. That’s fine by me, I’m not going to be worried until the binding starts coming apart. 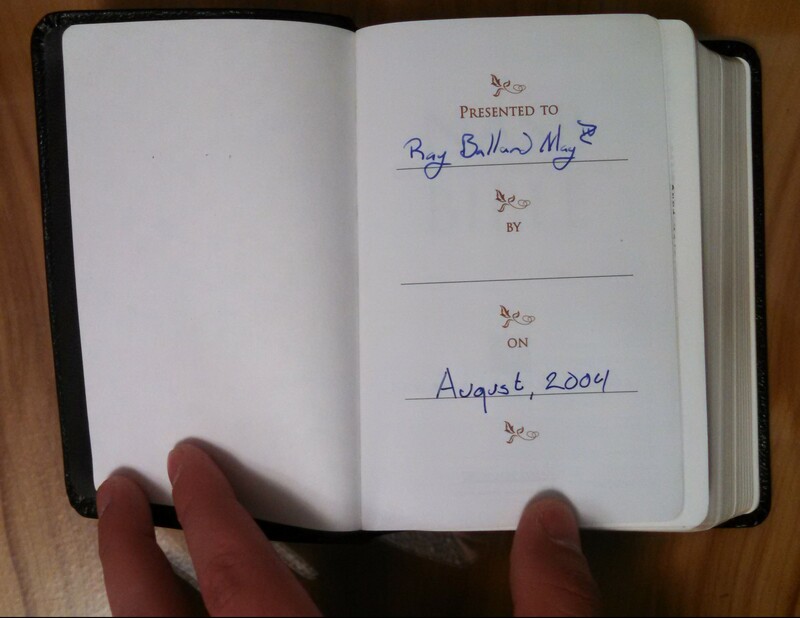 This Bible’s bonded leather cover is very tight even after ten years of use. It still will not lie open on a surface until you have made it a ways into the Bible. 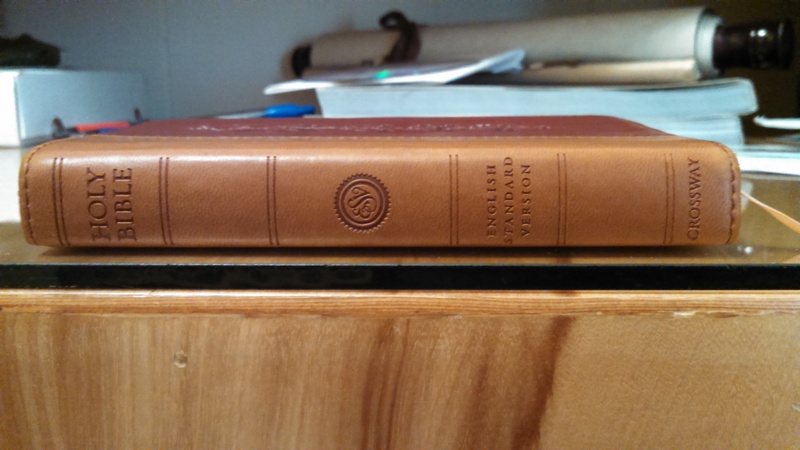 This Bible’s binding taught me how to put a weight on a Book without obscuring the text that is present. As you can see I am still have to hold the Bible open at its dedication page. I don’t think there are really words to express what the Bibles in this collection mean to me. They all have different purposes. I don’t use them all every day but I do use them all. The NASB to supplement the ESV the NIV to for notes and supplemental (idiomatic) readings to (more literal) ESV and NASB. I like to delve into the Greek and find out what is really being said in a given passage. There are few more translations that I use on a rare occasion and I am adding more. I have recently ordered and Holman Christian Standard Bible. I also use the World English Bible (WEB) as a text. For those of you who know that I am part of Breath of God Ministries, you know that we are trying to put out an edition of the WEB. Really that’s all there is to it. I mainly study out of the ESV, though, I use other supplemental versions and I don’t just use one Bible. I use many. With this blog being a ministerial platform for me (Ray B. May IV) I am going to change things up a bit. Instead of having the Table of Contents of my commentary/teaching on the Gospel of John as a featured article at the top of the Blog Roll I am going to have that as a separate page that you can go to and it will be linked to all the portions of the teaching. Another page that I am adding is a list of Poems that I will be adding. I am writing poetry now as well. If you like it, great! ; if not feel free to ignore it. I am calling the project “Psalms by RB” and the page will have a link to each blog post that contains one of the these Psalms/Poems. I hope that you enjoy them.